The four weeks between Matt and I finding out we were expecting, and having our first doctor’s appointment was such a joyous time for us. We were on cloud nine – we still are – but we definitely were then. It’s so funny looking back on that time, because I teased Matt the entire four weeks that we were having twins. I didn’t really believe it myself, I just loved messing with him. I still wanted twins, sure, but I definitely wasn’t expecting it. Matt would kiss me goodnight, then he’d lean down to kiss my belly as a way of kissing our baby goodnight too. I would look at him and say “Hey now, don’t be rude…kiss the other baby!”. He would always joke back with me, saying “Stop that nonsense!”. I did this all the way up until the day we actually found out. That morning, as we woke up and began to get ready for our appointment, I said to him, “Today’s the day we find out we’re having twins!”. And he just gave me another one of his nervous laughs as always. Matt ended up being just as excited about the actual news of our twins as I was, but I think he was more pre-occupied at the time with the thought that he, indeed, might be married to a psychic. After the news sunk in a little more, we began to talk about the genders – what each other hoped for and why. I hope this goes without saying, but we were obviously going to be pleased with whatever the Lord chose to give us. But we still had fun getting to know each other better by learning the other’s desires. We ended up having the same desires though! That tends to happen to us a lot actually, which is a huge blessing! We both decided our first choice (as if we have a choice) would be boy/girl twins! Neither of us know if we’ll be able to have any more kids after these two little ones or not. We certainly hope to have more biological kids as well as continue our adoption process, but only God knows for sure! So, knowing that we have the chance to have one of each gender in one pregnancy was exciting for us! I’d love to experience a little Matt and a little Cara right off the bat. We also continued to have this desire for a more pragmatic reason – we could only think of one boy name and one girl name that we completely loved. So, we decided to make things easy on ourselves and just wait to see if we even needed to think of more names before we stressed over it. Our second choice was two girls. We both just felt that girls would enjoy the ‘twin life’ more than boys. Maybe this is because I know two adorable twin girls – Audrey and Isabel – and they are just precious. They are two of my favorite kids ever! Maybe it’s because a lot of people dress twins all cutesy, and girls like cutesy things. I don’t know really! It’s definitely not a proven fact, just an opinion Matt and I both shared. We thought girls would like being twins better than boys. Our third choice was two boys, not because we like boys any less or anything, it’s just where we landed one day when dreaming about all this. So, that’s where we were at up until last night. Last night, as I was laying on the couch being the sickling that I am these days, I decided to brainstorm more baby names. As I read through countless websites and made lists of family names and Bible names, I kept being drawn to more boy names. I would read aloud combinations to Matt and neither of us loved any of the girl ones I came up with, but we fell in love with a second boy name! 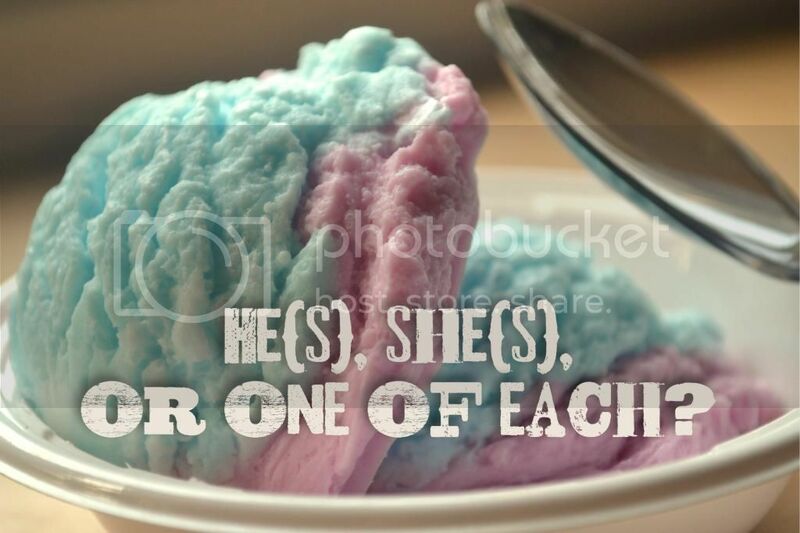 So I bet you’re all wondering now, which it is – He(s), She(s), or one of each!? Some of you probably even scrolled down to the bottom of the post thinking “Just announce it already, woman!”. Well, the truth is…. We don’t know yet… we hope to find out tomorrow! I know, I know… this blog post was no fun! But everyone always asks what you want and what you think it is, and so I figured I’d just share my thoughts very thoroughly to all of you at once. I want them all for different reasons! I’m just thankful that we’re both at a place where we’ll be happy with any combination. Boys, Girls, or one of each… no matter what, they’re gifts from God and we couldn’t be happier that He’s entrusted us to be their parents. For however long we have with you, little ones, we are thankful. And we’re so in love already! Lord uses you and Matt for His glory. I am so happy for you both!! I know you will be excellent Godly parents, so those little ones will be so very blessed! !